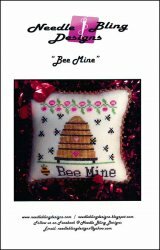 Bee Series: Bee Mine [C6366] - $8.00 : Yarn Tree, Your wholesale source for cross stitch supplies. Cross stitch pattern by Needle Bling Designs. Hey, what's all the "buzzzzz" around this beehive?!?! It's Valentine's Day! In celebration of Valentine's Day, there is a light & dark pink heart stitched on the beehive. A pink floral border is stitched at the top of the design. A bee with a crown on is stitched next to "Bee Mine." So the question still remains, will you "Bee Mine?" Stitch count 62h x 61w.